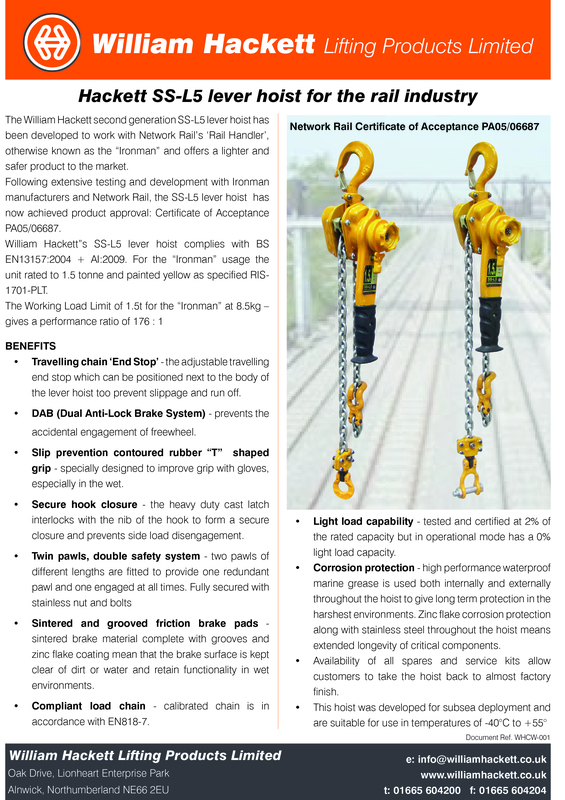 Gaylin International Pte Ltd and Rigmarine, part of its group of companies, will stock the William Hackett second-generation SS-L5 subsea lever hoist, available in capacities from 800kg to 20t, from 10 global locations. Further, they will support the product offering with comprehensive training and after-sales service. Singapore headquartered Gaylin, a specialist supplier of lifting, rigging and marine equipment primarily to the oil and gas industry, also has facilities in Korea, Malaysia, Vietnam, China and Indonesia. Rigmarine hubs, meanwhile, can be found at its most recently opened site in Aberdeen, in addition to Azerbaijan, Kazakhstan and the UAE. Mike Duncan, managing director at Gaylin, said: The SS-L5 is a great product in its own right, specifically designed for use in offshore and subsea operations, a key customer base for our companies. However, what creates the real customer value are the safety features of the hoist combined with out global stock and the level of training and support we offer alongside the equipment." He added: "Across the world we have the ability to service, repair and re-certify the subsea lever hoist, designed for multi-immersion over an extended period, and other equipment, in addition to conducting world-class, approved training. We can get personnel and equipment to an offshore location with a tailored solution as soon as the support is needed." For over two decades Rigmarine has offered an unrivalled range of 24/7 services to clients in the ultra demanding oil and gas sector. Since 2009 it has been operating its own training school in Azebaijan to provide employees and clients specialist training, available 365 days per year. Ben Burgess, director of William Hackett Lifting Products Ltd, said: We embrace this holistic approach to application of our equipment in the oil and gas sector. The product's life span will depend on the environment in which it is used, the frequency of use and the quality of its servicing. In partnership with Gaylin and Rigmarine, we are proud of the testing regime at our lifting centre of excellence in the UK." 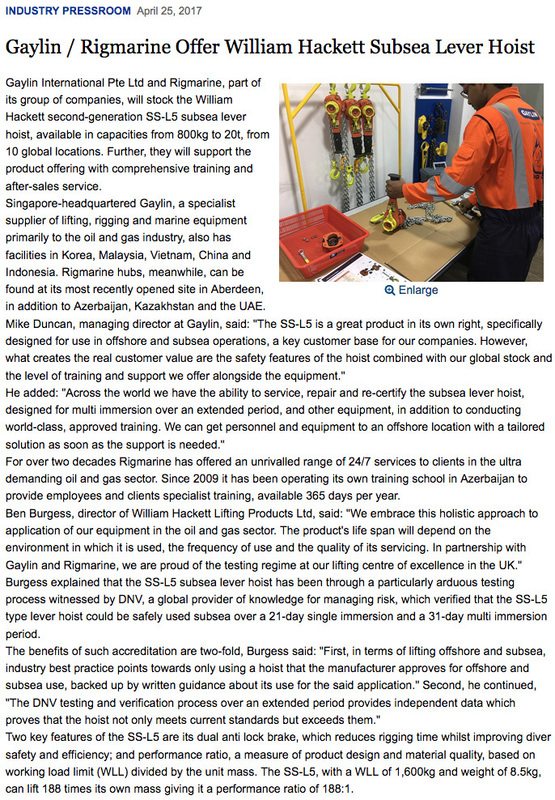 Burgess explained that the SS-L5 subsea lever hoist has been through a particularly arduous testing process witnessed by DNV, a global provider of knowledge for managing risk, which verified that the SS-L5 type lever hoist could be safely used subsea over a 21-day single immersion and a 31-day multi-immersion period. The benefits of such accreditation are two-fold, Burgess said: "First, in terms of lifting offshore and subsea, industry best practice points towards only using a hoist that the manufacturer approves for offshore and subsea use, backed up by written guidance about its use for the said application. "Second, he continued, "The DNV testing and verification process over an extended period provides independent data which proves that the hoist not only meets current standards but exceeds them." Two key features of the SS-L5 are its dual anti-lock brake, which reduces rigging time whilst improving diver safety and efficiency; and performance ratio, a measure of product design and material quality, based on working load limit (WLL) divided by the unit mass. The SS-L5, with a WLL of 1600kg and weight of 8.5kg, can lift 188 times its own mass giving it a performance ratio of 188:1.